Groin and upper thigh pain are not uncommon in young healthy people. Groin and upper thigh pain are common complaints at the chiropractic coalface. Femoro acetabular impingement syndrome and hip dysplasia are not infrequent causes. I have had cause to stop and ponder the significance of these discomforts recently. First it was the privilege to give a lecture on hip pain to a group of healthy students. Six out of 24 had quite serious groin and buttock issues. In 2014 I did a locum in Holland where a great many of the patients are elderly. A fair proportion have had total ball and socket replacements. The number of people suffering from very painful sacroiliac joint, side of the hip, groin and upper leg pain is quite staggering. 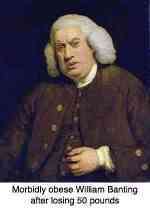 Disturbed nights, difficulty walking and considerable anguish are the order of the day. There's an assumption that all one needs is an operation, and the problem is cured. Whether it's hip or lower back, or any other surgery for that matter, it's best not to conclude that the knife will fix your pain, any more than chiropractic can permanently relieve it. Most of these conditions need exercises, care, and on going treatment no matter which professional you consult. Certainly an operation is not necessarily the cure you were hoping for. Interestingly yesterday I met a urologist of about my age; he told me that he spends his time trying to persuade older folk to expect and accept some problems, and not look to surgery to cure them. So, upper leg pain is a very common complaint at the chiropractic coalface; sometimes there are strong radiological signs, but often they are disconcertingly minor, and written off as an incidental finding. Just as important as that seen on the radiograph are the physical findings. If there are gross changes in the range of motion, whether the patient has pain or not, degenerative changes will develop with time if exercises are not started. Femoro acetabular impingement syndrome involves an underlying pincer or cam deformity in the hip, often missed by radiologists, or is mistakenly called arthritis; it's a major cause of groin and upper thigh pain. These deformities limit the movement, often when pulling the knee to the opposite shoulder, with pain in the groin; and untreated are the precursor to premature degenerative changes in the hip. 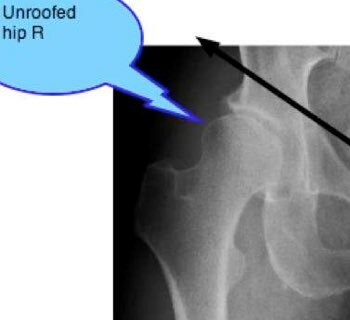 What is surprising is how very small pincers seen on x-ray can cause such a marked loss of flexibility in the hip, even in young people; the medical community thus write them off, but I believe them to be very significant; stiffness comes first, often unrecognised, and pain only later. Groin and upper thigh pain are frequent symptoms, and together with stiffness of the hip and loss of internal rotation, and other movements depending on the deformity, are the signs of an impingement syndrome. Today, I've just treated a lady who has had disabling groin and upper thigh pain for over a year. After just six chiropractic treatments of the sacroiliac joints and hip she declares she has 85% better. True, the pain recedes much faster than healing occurs, and so the 50 percent less pain rule applies, but she is ecstatic. Patrick's faber test where you lower the knee into the lotus position is often limited in the groin, or side of the hip. It also stresses the sacroiliac joints so is a useful part of the diagnostic examination. You can do it at home. Hip dysplasia causes the hypermobility that also results in groin and upper thigh pain, and often severe tenderness of the inner adductor muscles. Even worse are the femoral nerve lesions from the upper lumbar spine that radiate to the side of the thigh, groin and upper leg. Hip dysplasia must be differentiated from hypermobility without osseous abnormalities; the latter is not a precursor to arthritis, but it still causes upper leg pain. Most common of all, in the elderly, is a severely fixated sacroiliac joint. Cases of intermittent claudication can also cause groin and upper thigh pain; a blocked artery in the pelvis limiting the flow of blood to the leg. Only smokers seem to get it. Like angina, they only get the ache when exercising. I'm convinced the early diagnosis of many of these conditions could greatly reduce the number of total hip replacements being done. Oh, and two hip replacements that have been a total disaster consulted me in that one month in Holland. To succeed with these conditions, I have found that only by working in the lumbar spine, sacroiliac joint and in and around the hip joint is what relieves the pain. A lifetime of gentle hip exercises is a must. Use the search function in the navigation bar to find more information about all these conditions. The two common conditions causing groin and leg pain, both are pre arthritic, are hip dysplasia and femoro acetabular impingement syndrome. What's confusing is that both can exist in the same hip. The former, hip dysplasia, has too little coverage of the ball with the result that the range of motion is greatly increased. In FAIS the coverage is increased in one form, called Pincer. The range of motion is decreased; in fact it presents very like hip arthritis, but in the young person. Both, untreated, lead on to premature hip arthritis. If you start to get groin and upper thigh pain, don't ignore it; it's trying to tell you something. Both require gentle daily exercise; both demand an acceptance that you can't run marathons. The hip simply won't be able to take as many steps in a lifetime as a normal one. Chiropractic management of these groin and upper thigh pain conditions demands careful analysis to work out what is the primary cause; could it be in the main a short leg? Or is it a referred pain from the spine down one of the branches of the femoral nerve? Perhaps it could even be a Maigne's syndrome affecting the superior cluneals. 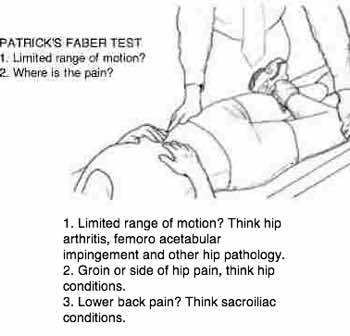 Patrick's faber test may be positive, but is the limitation in the hip or the sacroiliac joint? It takes a careful and thorough chiropractic examination to decide whether this is referred femoral nerve pain to the upper leg, or a condition within the pelvis. No doctor should always be running late, that's just bad management by the reception, but occasionally it's almost unavoidable. Groin and upper thigh pain are frequently caused by a hip abnormality such as dysplasia or FAIS. Go to Femoro Acetabular Impingement Syndrome case file. Chiropractic Help gets a lot of correspondence from folk world wide suffering from various maladies that haven't been solved by Medicine, and often frankly by Chiropractic too. It's a toss up whether more of them concerning tingling in the arms and hands, or groin and upper thigh pain. Both are miserable conditions that often defy a simple diagnosis and treatment. Obviously I cannot examine these folk, and frankly you should view anything you read on the internet with a certain amount of scepticism; but if you are suffering from insufferable pain, then perhaps you too might like to pop your question. Just because of curiosity you might like to view some of these disturbing letters. Do you have a question about your health? Do you have a question? Shoot! Please include important details such as when the problem started, what increases and relieves the pain, which movements cause dizziness, for example, whether the pain radiates to all the fingers or just the thumb and forefinger, or just certain parts of the leg. A two line question will get an answer of zero value. Entering your question is easy to do. Just type!... PLEASE NOTE THAT I DO NOT RESPOND TO SHODDY GRAMMAR AND SPELLING IF ENGLISH IS OBVIOUSLY YOUR HOME LANGUAGE. WRITE ON A COMPUTER, NOT A SMARTPHONE. Read your letter please BEFORE posting; I do not respond to shoddily written questions, so don't waste your time. Stop! Are you about to write on a not so smartphone? The chances are good you are wasting your time and won't get a reply. Please note: Google has taken a very strong stand against poor grammar, use of dot dot dot, capitals and generally bad English. They downgrade the whole site. So, if you are going to take the time to pose a question, take a few extra moments and write in decent English. I get dozens of letters and have not the time to correct your grammar. It's not smart to write from your phone; use a computer. Do you have some xrays or graphics to add? Great! Click the button and find the first one on your computer. Select it and click on the button to choose it. Click below to see contributions from other visitors.